In this post, we’re going to focus on the benefits of air purifiers. Throughout our site, we’ve reviewed many types of air purifiers. However, we know that for some of you, the question isn’t what air purifier is the best, but whether or not you really need an air cleaner. How does an air purifier help you and your family? What problems can it tackle inside your home? Is it really worth the money? We received a variety of answers that you can read in the post below. Hopefully, this information is exactly what you’re looking for and will help you make a final decision on whether or not you’d like to purchase an air purifier for your home. Clean air is important for overall quality of life, but if you’re an allergy or asthma sufferer, it’s essential. Even in a seemingly clean environment, the air can still be filled with invisible particulates like mold, pet dander, dust mites, etc., which will aggravate existing allergy sensitivities. With the right air purifier, most of these particulates will be filtered out, allowing you and your family to relax and breathe easier. Cooking with gas burners releases excessive amounts of nitrogen dioxide, carbon monoxide, and ultrafine particles into the air. And if you’re frying anything, the smoke and smell can provide an unpleasant environment for any visiting guests. An advanced air purifier will reduce any cooking odors, harmful gases, and unpleasant fumes, so you can invite friends over with confidence. Sleep has been linked to improved cognitive abilities, reduced depression and higher academic performance. However, this can be difficult if you’re experiencing symptoms like congestion, stuffy noses, sneezing, sinus headaches from mold, dust or dander in your bedroom. An air purifier with an advanced filter cleans the air of particles that cause those types of health issues. This leads to a better night’s sleep, letting you make the most of your days. All types of pollen can wreak havoc on allergy suffers throughout the year, specifically during Spring and Fall months. The benefit of air purifiers with removable/replaceable pre-filters is that they capture larger particles (many types of pollen) while preserving the main HEPA particle filter for smaller particles. This design allows the main filter to last longer. People have even told us that they have stopped using over-the-counter allergy medication after using their purifier. The benefits of an air purifier in a bedroom allows for better/easier breathing at night, allowing your body to recuperate from the day at a quicker rate. After a good night sleep, a well-rested person is proven to be more productive and energetic throughout the day. People with COPD or other respiratory conditions have a challenging time breathing and often times require an inhaler. When people with these conditions use an air purifier they find themselves using their inhaler less, or potentially not at all, while in the vicinity of the device. One of the major benefits of using an air purifier is to help clean pet hair and dander out of the air. Many breeds of cats and dogs shed throughout the year and when an animal scratches itself the hair and dander fly all over. Vacuuming every day to get rid of these particles can be a huge pain. An air purifier works 24/7 to remove dander and hair from your home so you don’t have to labor over it. For some people, their allergies are seasonal, but for others, they last all year long. In order to get the best relief, it’s important to have a safe environment to go to when your symptoms are acting up. Having an air purifier in the home helps to reduce allergy problems by stripping the allergens out of the air before they have a chance to irritate your lungs or eyes. Air purifiers remove harmful particles like mold spores and bacteria. This helps keep your home a safe and healthy place. The PlasmaWave feature on Winix air purifiers aides in this protection and helps to create a sterile environment inside your home. This leads to an overall healthier air space for you to breathe day and night. The most common respiratory triggers are allergens such as pollen, dust, mold spores and pet dander, although there are other triggers such as tobacco smoke, exhaust fumes, and VOCs. Although many people are aware of the dangers of poor air quality, most do not realize that indoor air pollution is often worse than outdoors. Whether it’s the smell of a pet or from an overflowing full trash can, unwanted odors will have you running to open a window. The benefits of having an air purifier with a quality activated carbon filter, especially charcoal-based, will reduce odors and help your air smell “fresh” again. Cold weather forces many of us to be cramped indoors which can lead to a game of “tag” when it comes to Influenza. Some air purifiers have filters that can trap particles that carry viruses that you could otherwise be breathing in. Regardless of the reason why you use an air purifier, clean air is vital in one’s overall health. The U.S. Environmental Protection Agency (EPA) estimates that indoor air can be up to five times worse than outdoor air. Many people don’t realize how many pollution sources exist in their homes such as cleaning products, pet dander, scented candles, indoor paints and cooking fumes. Our Dyson Pure Cool air purifier uses a fully sealed filter system that includes 60% more HEPA media and three times more activated carbon than the previous generation to capture 99.97% of particle pollution as small as 0.3 microns. This keeps your home clean and captures irritating pollutants and allergens. Also unique to our product is that it doesn’t just act as a purifier, it also functions as a fan. Using Air Multiplier™ technology and 350⁰ degree oscillation, Pure Cool projects clean air throughout the room. Of course, in the summer the cooling feature can be a lifesaver. To allow for year-round usage, the air purifier also features a new backward diffused airflow mode or purification-only mode. Purified air can be very beneficial for quality sleep. In 2017 we conducted a sleep study survey, where more than 70% of people surveyed felt better rested after sleep from using an air purifier. An air purifier can efficiently purify indoor air by getting rid of harmful pollutants, such as dust, pollen, smoke, odor, mold spores and pet dander. It is especially important for pregnant women and newborns. Fresh and clean air can calm down our nerves and provide better rest for us. Air purifiers silently provide a relaxed atmosphere while we are reading, sleeping or doing yoga. Air cleaners are ideal for springtime and allergy season by reducing skin rashes, dryness or dullness. This is great for women who want a better complexion without using as many cosmetic products. Anyone living in a clean environment like in Switzerland, Scandinavia or a remote island, may wonder why they need an air purifier. The answer is that indoor microbiologic contamination continuously grows regardless of how pure the air is outdoors. Mold, bacteria, and viruses thrive in closed, humid environments with limited ventilation or air-conditioned rooms. Harmful mold multiplies in colonies everywhere on walls, floor, carpets, furniture, continuously spreading spores. These new colonies increase room contamination and can be inhaled, causing asthma and other respiratory allergies or chronic diseases. By comparison, people allergic to seafood avoid their symptoms by not consuming it. Respiratory allergies work much the same way, as one should not inhale what causes the allergy symptoms. The only way to avoid these symptoms is for sufferers to use an air purifier that can destroy those allergens. Mold and dust mite allergens are enemies to asthmatics and respiratory allergy sufferers. Therefore, the key to quality health is to destroy them. Mold is also capable of damaging all kinds of organic items like books, paintings, furniture, sofas and walls, affecting people’s health while working or living in those environments. When looking for the best air purifier to remove or destroy allergens, one must review independent tests disclosed by manufacturers to ensure it will eliminate that specific allergen. Surely it makes sense to destroy harmful allergens, rather than to merely capture them and keep them alive on a filter for 1-6 months, where they still have direct contact with the room, especially when replacing it. As a father of an allergic son, I worked tirelessly to help reduce his symptoms and his reliance on medicine to feel better. I was inspired to invent a technology which transformed into a successful business, where I can help people like my son live better. I was assured through using this technology at home that it really worked, and eventually confirmed its efficacy through independent laboratory tests worldwide. Anyone who suffers or has children affected by respiratory allergies knows how difficult poor quality rest and interrupted sleep can be in their daily lives. I remember a particular case from a few years ago in a small village in Northern Scotland. Mairead, a young girl, had to be flown to London every September due to her asthma attacks caused by indoor mold and dust mites. It was rewarding to see how she improved her well being by simply avoiding her asthma symptoms with one of our air purifiers. She was happy to avoid the forced flights to a hospital in London and have a normal childhood. Asthma is a lifelong condition and a costly disease affecting people from all age groups, having its peak incidence in childhood. The treatment costs are quite a burden for the affected families. Air purifiers that truly destroy the airborne allergens causing an allergy symptom, and by that reducing the demand of new medicines, are the simplest way to reduce health care costs and improve the quality of life of the allergy sufferers. Avoiding one allergy symptom is better than treating it. An ounce of prevention is worth a pound of cure. Traditional systems rely on air passing through a filter, while Sharp’s Plasmacluster® Air Purifier disperses ions throughout the room where they actively attach to and break down pollutants. This process allows the air purifier to clean every corner of the room, attacking germs, bacteria, viruses and more. In addition to breaking down pollutants, an air purifier can help reduce odors. If you are an animal owner, Plasmacluster® ions can help to virtually eliminate these odors often embedded in carpets, drapery, and furniture. We all dread and fear mold, present in both indoor and outdoor air. Using an air purifier helps to reduce the mold level in a home, minimizing its effect on allergies and improving general health. Air purifiers help people who suffer from asthma, COPD, allergies and compromised immune systems (including premature babies and the elderly). Approximately 18 million adults and 7 million children live with asthma. According to the American Academy of Allergy Asthma & Immunology, approximately 7.8% of American adults and 10% of children have hay fever, otherwise known as allergic rhinitis. Hay fever causes cold-like symptoms, such as a runny nose, itchy eyes, congestion, sneezing and sinus pressure. It is caused by an allergic response to pollen, dust mites or pet dander. Air purifiers, like those found in Beyond by Aerus products, help reduce and eliminate the pollutants that contribute to allergies and asthma. Some indoor air purifiers can reduce or eliminate pet dander in the home and unpleasant pet odors. Air cleaners have brought relief to thousands of pet owners who suffer from severe allergies. According to studies published in the Journal of Allergy and Clinical Immunology, a scientific journal published by the American Academy of Allergy, Asthma, and Immunology (AAAA&I), up to 10% of the general population and 40% of allergic individuals react to cats and dogs. Some advanced indoor air quality products, such as the ActivePure™ technology found in Beyond by Aerus products, cleans, freshens and purifies the air using specialized germicidal UV light waves along with a proprietary catalytic process. Unlike traditional air filters, this technology also cleans surfaces, up to 99% reduction in contaminants on surfaces, like kitchen sinks, keyboards, TV remotes, doorknobs, and carpets. One of the top benefits of having an air purifier, such as Wynd, is to help ease the symptoms of allergies, especially now during allergy season. An air purifier will help get rid of dust, mold, pollen, and dander which trigger allergy symptoms and make it difficult for allergy sufferers to feel good. Another reason that using an air purifier is beneficial is that it helps eliminate odor, pollen, smoke, dust and pet dander from your environment. Without having an air purifier, your house can accumulate dust and germs which can lead to future health problems. You will notice a difference in the pollution levels of your air, your breathing, and overall health with regular usage of a purifier. A final reason to use an air purifier is to help ensure a good night’s sleep. Invisible air particles floating around can cause congestion right before you sleep. Poor air quality can lead to poor sleep which can cause fatigue and other health problems. The benefits of air purifier in a bedroom is that it will help clear the airborne particles before and while you sleep and your quality of sleep will improve. People with asthma are at a greater risk from breathing in these small particles during the night, which can trigger asthma attacks. We hear from many of our customers that using an air purifier has changed their lives. The most common benefit we hear is from people with allergies and asthma. For people with asthma or allergies to pets, dust mites, or pollen, air purifiers significantly reduce the number of allergens and irritants in the air and help relieve common symptoms such as watery eyes, congestion, and coughing associated with these conditions. The second benefit of air purifiers is for improved indoor air quality. Indoor air quality in most homes is actually worse than outside air. Everyday common things we do or use such as fireplaces, space heaters, particle board furniture, household cleaning products, aerosol-based products, cooking, and burning candles can contribute to poor indoor air quality. Using an air purifier will filter indoor air pollutants out of the air so you are not breathing them in. The third benefit is to control unwanted odors such as smoke, cooking smells, pet odors, cat litter box odors, or a smelly garbage can. Air purifiers absorb and eliminate odors from the air and will freshen up stale indoor air. Finally, the key to a good air purifier is a powerful motor. The more times air is circulated and filtered per hour the more beneficial an air purifier will be. InvisiClean’s air purifiers use strong motors that will sufficiently circulate and clean the air in any size room. We recommend a good air purifier to keep your indoor air much cleaner and healthier to breathe for everyone. Long-term exposure to these invisible pollutants can be carcinogenic. They can also lead to neurological damage and increase your chances of getting dementia and Alzheimer’s disease. One of the top benefits of Airpura purifiers is that they will reduce these contaminants from your indoor air by as much as 99%. Night time is typically when the human body goes into “restoration” mode and everything slows down. However, inhaling pollutants that are small enough to bypass your nose hairs filters can make your lungs go into overdrive at night, working hard to rid your body of these invaders. This can also make your heart pump faster. Having an Airpura purifier like the Airpura R600 in your bedroom to reduce airborne particles can help you get a better night’s rest and wake up refreshed the next morning. Studies have shown that reducing the indoor air pollutants (in particular volatile organic compounds or VOCs) has a positive effect on people’s cognitive functions. Examples of VOCs are gasoline, benzene, formaldehyde, and solvents such as toluene and xylene. VOCs and can also be found in cleaning materials, building materials, paint thinners, air fresheners, hobby supplies, wood preservatives, aerosol sprays, etc. When the amount of VOCs in the air was reduced, individuals were found to be able to process information better, thus leading to increased productivity levels and better decision-making. The Airpura V600 is one of the most effective ways of reducing VOCs from your indoor air and the Airpura C600 DLX for heavy-duty air filtration. Air purifiers help manage exposure to allergens and improve air quality in the home. This can be particularly beneficial to allergy and asthma sufferers, no matter the season. According to a new survey of parents by Honeywell air purifiers, 79% prefer medication not be their first line of defense for those in the family with allergies. Using a HEPA portable air purifier, such as Honeywell HEPA air purifiers, helps tackle allergens at their source, capturing up to 99.97% of airborne allergens 0.3 microns and larger that pass through the filter, such as pet dander, dust, and pollen. In addition, air purifiers can help clean and freshen the air in your home by filtering out airborne pollutants like smoke and certain bacteria and viruses, while also absorbing pesky odors with an activated carbon filter. And beyond food odors and cooking smoke, the VOC sensor on select Honeywell Air Purifiers can sense irritating VOCs in the air and will run the air purifier automatically to help reduce these harmful gases. If you have ever walked into a room – maybe even your house – and started experiencing a flare-up, the culprit behind this could likely be indoor allergens trapped within the confines of the environment. Indoor allergens are miniscule in size and easily settle onto surfaces in your home and eventually become pushed into the air, which can elicit allergy symptoms. When this occurs an air purification system – like the EnviroKlenz Mobile Air System will begin its job by working to take in these allergens and breaking them down once it is passed through the filtration process, which in turn will help to minimize allergens in your indoor environment. Colds, flus, viruses, and even mold spread through microorganisms that become airborne in the environment. Closed, sealed environments like a home or office can collect these organisms and spread them into the air. An air purifier – such as the EnviroKlenz UV Mobile Air System with ultraviolet germicidal radiation (UVC lights) will effectively kill these microorganisms with a high efficiency. Thus, alleviating fears of potential viruses, bacteria, or mold spores in your indoor air that could affect your health. VOCs and odorous compounds are closer than you may think. Many homes and office buildings will have an insurmountable amount of chemicals and odors within the confines of the environment, strongly due to the number of products that, unfortunately, contain some potentially hazardous VOCs and odors. The ability to eliminate these noxious and toxic odors and chemicals (VOCs) is a major benefit of having an air purification system in your indoor environment. The EnviroKlenz Mobile Air System utilizes a patented earth mineral technology that is highly reactive at breaking down a broad spectrum of chemicals and odors that are found in your indoor air. As well as eliminating small particulate matter that can be found in VOCs, allergens, and microorganisms by using a hospital-grade HEPA filter. A strong benefit of air purifiers is that they reduce cooking smells in the kitchen so there is no need to use synthetic air fresheners. Air purifiers are also great help to keep areas dust-free. Sometimes regular vacuuming doesn’t do a good enough job. Thanks to innovative technology and ozone generation, air purifiers reduce small particles of dust and even cigarette smoke. People who suffer from asthma, allergies and other respiratory conditions can benefit from using these air cleaners, as well as pet owners who are facing problems with odors, urine, and dander. All of these issues can be quite upsetting, but these devices proved to be effective in dealing with them. Some air purifiers provide full sanitation and kill bacteria, mold, and fungus. It is important to feel safe at your own home and breathe fresh air. These machines even work in the rooms with high amounts of humidity. Air purifiers are the perfect solution for areas that are not ventilated frequently such as storage rooms, garages, and basements. There are different kinds of purifiers on the market. They are available for home and commercial use. Air purifiers come in different sizes depending on the area that you need them for and there are even some portable models that can be used for traveling. First, compare the air purification efficiency of the filtration process. Passive adsorption purification air purifier adopts the fan + filter mode for air purification, and wind flow of air will inevitably lead to blind spots. Therefore, most of the passive air purification can only produce certain purification around the air purifier. The effect is that it will take a long time to filter the indoor air all over again, and it is difficult to have an effect on the purification of the entire indoor environment. Active air purification uses the diffuse characteristics of air to reach the air purification in every corner of the air. The air can be diffused to the place where it can produce purification effects. Anion air purifiers were compared to find that, after releasing negative ions in the air, negative ions can take the initiative to attack, find pollution particles in the air, and agglomerate and actively settle them. From this point alone, active air purification has obvious advantages. The second is to compare the removal effects of small-particle air pollutants. The most harmful air pollutants to humans are fine particles with a diameter less than 2.5 μm (ie, PM2.5, which is medically called lung particulate matter). Through experimental research, it has been found that for PM2.5 and other small particles, the passive purification mode is powerless, and PM2.5 and other small particles can easily penetrate through the filter, activated carbon and other substances, and re-enter the air to harm human health. The comparison of the negative ion air purifiers based on the principle of active purification to air purification shows that small particles of negative ions in the air can not only easily remove large particles in the air, but also it is difficult for the air purifier to have a diameter of less than 0.01. Removed particulate fly dust has a 100% settlement removal effect. Imitating Nature’s eco-level negative ion generation technology has been introduced, its characteristics are small particle size, high activity, with its excellent diffusion and health effects to achieve better air optimization. Finally, a comparative analysis of the quality of air treatment. The study found that under the principle of passive air purification if the filter pore size is small enough for the purpose of air treatment can only achieve the purpose of purification, that can only get “clean” air; while the negative ion air purifier is different, not only able to effectively remove particulate contaminants in the air, decompose harmful gases such as formaldehyde, provide clean air to the indoor environment, and provide air-negative ions that are highly effective for human convalescence and health care to the indoor environment, so that indoor air quality can reach “healthy air” standard. Many common air pollutants in the air today are byproduct emissions from furniture, wall paint, cosmetics, air fresheners, cleansers, carpets, aerosol propellants, pens and markers, building material, waxes and polishes, plasticizers, etc. Choosing the right air purifiers will take care of harmful particles like formaldehyde, fungi and various VOCs (Volatile Organic Compounds) which lead to hazardous health diseases, including asthma and allergy suffering. We humans breathe on average 15 kilos of air every day, including the dust particles that come with air. Air purifiers help us inhale a lot less unhealthy dust and decrease the need for cleaning since they remove a large portion of the dust which is generated daily. The benefits of a room air purifier with a highly efficient HEPA filter (certified to be at least 99% effective on particulate matter less than 0.3 microns in size) and equipped with molecular filters, can ensure a healthier indoor environment by removing the ultrafine dust particles, contaminants, bacteria’s and harmful gaseous. Air purifiers reduce typical “bad air” symptoms like headaches, coughing, allergic reaction, respiratory problems, eye irritation, nausea and skin rashes, etc. which are the effects of molecular pollutants. They do that by replenishing good bacteria in homes and building whose air purification systems are designed to kill all bacteria. They purify areas that are not normally within reach of other air purifying systems. Enviro-Biotics™ are 100% natural, chemical-free and environmentally friendly, avoiding harsh chemical-based solutions that encourage bacteria to develop resistance. Instead, Enviro-Biotics™ multiply beneficial microflora that crowds out harmful bacteria and provides a cleaner, fresher space. In addition to purifying the air, Enviro-Biotics™ also assist in cleaning and maintain the cleanliness of the air duct systems themselves. Better Air’s systems work in tandem with air duct systems to ensure that the air being circulated is itself clean, and also can serve as a way to protect against a colony of bacteria or other pathogens taking up residence within the duct system. According to the 2017-2018 National Pet Owner Survey conducted by the American Pet Products Association, sixty-eight percent of U.S. households, or about 85 million families, own a pet. Similar statistics are found worldwide. That’s lots of pets and people together in homes. All benefit from the use of air purifiers, but the key to success to enjoying the following benefits is it must be the right air purifier used the right way. Not only do air purifiers outfitted with the correct filter help eliminate human allergies, they can also help pets with their seasonal allergies and pet atopic dermatitis, reducing, if not eliminating, the need for topical treatments and medications that can have harmful, long-term effects. Air purifiers with the right amount of commercial strength ultraviolet germicidal irradiation (UVGI) – not just any UV lamp – can kill over 99.9% of illness-causing viruses, bacteria, and germs at their source, naturally, by disrupting the microorganism’s DNA. This causes the death of the cell and renders it helpless. A major benefit of air purifiers is that there is less need for harsh cleaning chemicals that can lead to additional health problems. Sources of indoor air pollution cover virtually every inch of a home and come from carpeting, manufactured wood products, paint, pesticides, synthetically “fragranced” personal and cleaning products, just to name a few. Exposure to the volatile organic compounds (VOCs) emitted by these sources can lead to chronic and acute negative health effects. Beyond controlling typical pet odors, air purifiers with the right amount of UVGI, in combination with a charcoal filter or photocatalytic oxidation, can also neutralize these harmful VOCs, making homes safer and healthier for people and pets. The air that we breathe is essential to life. However, our inhaling and exhaling is so automatic that we hardly ever think about our breathing or the kind of air we are taking into our bodies. Yet we cannot afford to take the quality of the air we breathe for granted. Though our senses may not detect allergens, particulate matter, chemicals, viruses, mold spores, and other such things in the air around us, these common indoor air pollutants will wreak havoc on our bodies if they go unchecked. All in all, using an air purification machine to clean indoor air is a great way to improve one’s overall quality of life. Devices that purify the air prevent respiratory conditions from worsening, and they also help to keep lungs healthy because they remove the substances from the air that can irritate our lungs. Air purifiers allow us to enjoy the world around us more, and at night, enjoy a deeper good night’s sleep. Hypoallergenic Air’s Sanitizers have the added benefit of neutralizing harmful contaminants like viruses and bacteria on surfaces throughout a house such as door handles and countertops, as well as suppressing mold growth in bathrooms and on walls. 1. Purifying the air in your home from allergens such as pet dander, dust, mold, bacteria, virus, etc. Allergens such as these can be very dangerous and potentially harmful to your health. This is especially important for individuals who are chemically sensitive, highly allergic or asthmatic. Ultrafine particles which get lodged deep within our bloodstream are now known to cause cardiovascular disease, stroke, and cancer. Using HEPA or Better than HEPA efficiency systems will likely remove these dangerous particulates. Make sure the efficiency rating is total system efficiency, not simply the filters manufactured efficiency. This decreases your risk of developing chronic respiratory illnesses, asthma, allergies, and cancer. Ingestion of toxic particles has been linked to liver damage, lung cancer, and even Alzheimer’s disease. High-quality air cleaners using granular adsorbents have the ability to remove many common VOC’s found in the home like toluene, benzene, and formaldehyde. People are increasingly trying to understand and focus on the effects environmental stress can have on the body and mind. Studies have linked air pollution to changes in mood and behavior as well as psychiatric symptoms, including anxiety. Air purifiers clean up this pollution so you can feel better in both body and mind. The air inside our homes can be 5 TIMES more polluted than the outside air. The average home contains more than 500 harmful chemicals, bacteria and other invisible toxins like pollen, dust, pet dander and mold that have a negative impact on our health. This worsens allergy and asthma symptoms and can even lead to increased risks of cancer, respiratory problems, and other chronic illnesses down the line. Scary thought, right? Seasonal allergies affect approximately 30% of U.S. residents – but this year, due to unusually warm weather patterns, allergy season is not only starting earlier, it’s expected to last longer AND is packing an even bigger punch with higher-than-normal pollen levels. As such, allergy suffers are bracing themselves for worsened symptoms like sneezing, itchy eyes, nasal congestion and trouble breathing. Formaldehyde is one of the most harmful indoor air pollutants according to the World Health Organization. It is a known cancer-causing carcinogen which also aggravates allergies and asthma. Formaldehyde is found in almost all of our houses, sometimes in high concentration rates and it could come from a multitude of items. Building material and household products are some examples. VOCs, or volatile organic compounds, float around in the air of many homes. These chemicals turn into vapor at normal room temperatures. Some of them are known to be harmful to your health, especially in large accumulations. Some paints, coatings and other household substances contain anthropogenic VOCs that can be quite dangerous. Studies have shown that consistent indoor exposure to these VOCs can be linked to a higher risk of cancers like lymphoma and leukemia. Not all air purifiers have the capability to remove VOCs from the air inside your home. So, if VOC removal is a major concern for you, make sure you choose an air purifier with the ability to remove these chemicals. Unfortunately, many different kinds of air pollutants can exist within your home. This may include pollen, dust mite allergens, plant spores, fungi, mold, bacteria, pet allergens and more. Most air purifiers utilize HEPA (high-efficiency particulate air) filters to help remove these particles from the air in your home. HEPA filters are extremely effective and remove more than 99% of the pollutant particles in the room. Many air purifiers also utilize carbon filters to keep the air inside your home smelling fresh and clean. These filters absorb odor molecules as the air passes through the purifier. While odor removal may not be a direct health issue, a clean smelling home is definitely a big benefit for many homeowners. What we find out from listening to our customers is that better air quality makes a difference in their lives. Just last week we heard from Bonnie in Idaho. She told us that within 30 minutes of turning on her Maxum Electrostatic air purifier for the first time, she noticed a new freshness in the air in her home. Bonnie has pets and her husband is a smoker. The air purifier started working on these air quality issues immediately. Statistics tell us the air in our homes is up to 5 times more polluted than outside air. Further data shows us we spend about 90% of our time indoors. A good room air purifier like the Maxum can greatly increase how much we enjoy our lives where we spend most of our time. For our response to the second best benefit, I would like to refer to one of our programs where we provide air purifiers for school classrooms. We allow schools to try an air purifier for free for 90 days. What we have learned from the teachers and children in these classrooms is that having a room air purifier makes the room healthier. School absenteeism was greatly reduced. The use of inhalers and other respiratory aids dropped significantly. The classrooms were a more energetic place. The extra energy and lack of annoying coughing and sneezing made for a better learning environment. So my second best reason to have an air purifier is the promotion of better health. The EPA lists the following as the effects of indoor air pollution on Human Health. Irritation of the eyes, nose, and throat. Respiratory diseases, heart disease, and cancer. The very old and very young are especially susceptible to these respiratory threats. An air purifier can do a great deal to protect you from these dangers. My choice for the third great benefit from an air purifier is safety; especially safety on the job. When we speak to plant managers and safety personnel, they express a need to provide a safer work environment. A local machine shop is purchasing 6 LA-2000 air purifiers to help remove oil and smoke from the air which are byproducts of the machining process. The State of California just completed a purchase of more than 50 Maxum Media air purifiers to help protect the officers and workers in the evidence rooms of the California Highway Patrol. Many dangerous substances are stored in these rooms awaiting trial. The air purifier will mitigate the dangers associated with these substances. The workplace has inherent dangers related to each individual occupation. A good quality air purifier can help increase the comfort and safety of the workers, whether they are police officers or hard-working machinist. The employees who help keep this country great deserve hard-working air purifiers to help keep them safe. In conclusion, using an air purifier is helpful for any person that cares about their health and comfort. If you have a respiratory condition from asthma or allergies, live with pets, or just want a better night’s sleep, then an air cleaner is a great investment to have around the home. 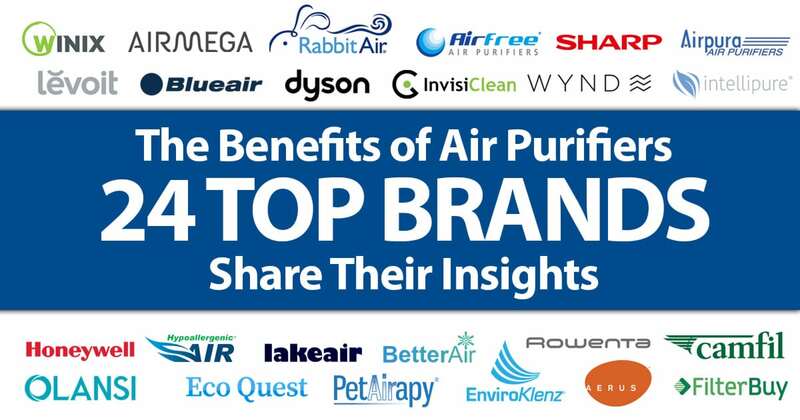 We’d like to give a special thanks to all of the air purifier manufacturers that contributed to this article. We’d also like to thank Minuca Elena for helping create this expert round up post. If you have any more questions about the benefits of air purifiers, feel free to contact us or the brands mentioned above. And if you found this post helpful, please share it on social media for others to enjoy! Do air purifiers remove odors? What is a travel air purifier?